Toyo Harada's manipulative ways finally push Peter Stancheck over the edge. With the death of his best friend, at the hands of the Harbinger Foundation, Peter decides that he's had enough of Harada's manipulations and finally challenges his would be master head on...and the fate of the world just might hang in the balance. Reaching the end of its introductory story arc, Joshua Dysart's Harbinger reaches its first climactic threshold when Peter decides to break with Harada's Foundation. Peter declares war on the man and his puppets after Harada has Peter's only friend, Joe, murdered in a desperate attempt to bring Peter back into the fold, heart and soul. The plan backfires terribly and Peter launches an all out attack on Harada. Dysart builds Peter's depth of character this issue by having him overcome certain obstacles (namely a Foundation student who has been a particular thorn in Peter's side) without the use of his powers. Peter proves to be a resourceful and quick on his feet fighter. It's just another example of Dysart's masterful character building. Khari Evans brings the arc to a powerful conclusion visually just as strongly as he brought it to life. His unique style of drawing anatomy has steadily become more and more pliable and therefore a bit unbelievable looking at times. It really creates a strong sense of just how unique each of these characters are though visually. He particularly does a good job depicting the wild aerial battles between the highly powerful psionics that dominate the storyline. Not without a few surprises, Harbinger #5 neatly wraps up the title's first story arc and lays a strong foundation for where Dysart is looking to take this series next. 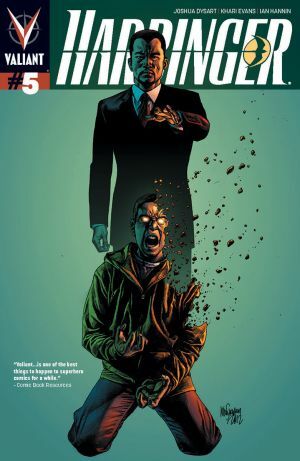 A pivotal issue in the young series' life, Harbinger #5 is not to be missed.